NCR, NO OPERATING SYSTEM Barcoding Store, powered by Strategic Mobiltiy Group, LLC (SMG3) offers globally recognized products and industry-leading solutions to enhance your organnization's productivity. Combining optimal search functionality and industry-leading products from Zebra, Honeywell, AML, etc., Barcoding Store creates a superior shopping experience unlike any other withing our industry. STUDIO PROPER, X LOCK MOUNT DISK - WHITE, MOUNT YOUR IPAD AND IPAD MINI TO ANY SURFACE, QUICK TURN AND CLICK AND THE IPAD IS MOUNTED, ANOTHER SPIN AND IT MOVES BETWEEN PORTRAIT AND LANDSCAPE ORIENTAT Barcoding Store, powered by Strategic Mobiltiy Group, LLC (SMG3) offers globally recognized products and industry-leading solutions to enhance your organnization's productivity. Combining optimal search functionality and industry-leading products from Zebra, Honeywell, AML, etc., Barcoding Store creates a superior shopping experience unlike any other withing our industry. Material Description: Premium silver gloss thermal transfer polyester label with a high-tack permanent acrylic adhesive. Ideal for applications that require up to 3 years outdoors, resistance to moderate chemicals and temperature exposure up to 300?F. Additional Information: 4 labels across. UL/cUL indoor/outdoor and CSA indoor/outdoor recognition when paired with Zebra's 5095 and 5100 resin ribbon. Estimated Case Weight: 1 lb. Material Description: Thermal transfer silver matte polyester label with a tamper-evident adhesive that leaves a "void" pattern when removed. Additional Information: UL/cUL indoor/outdoor certification when paired with Zebra's 5586 ribbon. Estimated Case Weight: 2 lbs. SPACEPOLE, ESSENTIALS FOR NCR: LOCKING CONNECTION ARM WITH NCR VESA 50/75 PLATE (BLACK) Barcoding Store, powered by Strategic Mobiltiy Group, LLC (SMG3) offers globally recognized products and industry-leading solutions to enhance your organnization's productivity. Combining optimal search functionality and industry-leading products from Zebra, Honeywell, AML, etc., Barcoding Store creates a superior shopping experience unlike any other withing our industry. Additional Information: UL/cUL indoor/outdoor recognition and CSA indoor/outdoor recognition when paired with the following Zebra ribbon series: 3200, 6100, 5586, 5095, and 6200. Estimated Case Weight: 5 lbs. Estimated Case Weight: 3 lbs. 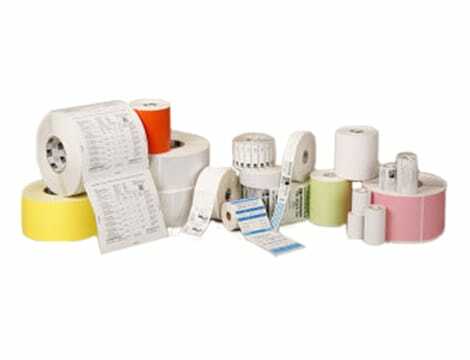 ZEBRACARD, CONSUMABLES, YMCKOK TRUE COLOURS C SERIES 6 PANEL COLOR RIBBON, P4XX, P5XX, P600, P720C COMPATIBLE, 170 IMAGES PER ROLL, PRICED PER ROLL Barcoding Store, powered by Strategic Mobiltiy Group, LLC (SMG3) offers globally recognized products and industry-leading solutions to enhance your organnization's productivity. Combining optimal search functionality and industry-leading products from Zebra, Honeywell, AML, etc., Barcoding Store creates a superior shopping experience unlike any other withing our industry. Additional Information: UL/cUL indoor/outdoor and CSA indoor/outdoor recognition when paired with Zebra's 5095 and 5100 resin ribbon. ENS, VERGEO ISMP4, LOW PROFILE SQUARE BASE STAND FOR INGENICO ISMP4 WITH INTEGRATED CHARGING AND COMMUNICATION, 30-60, TILT AND 180 SWIVEL BASE ROTATION Barcoding Store, powered by Strategic Mobiltiy Group, LLC (SMG3) offers globally recognized products and industry-leading solutions to enhance your organnization's productivity. Combining optimal search functionality and industry-leading products from Zebra, Honeywell, AML, etc., Barcoding Store creates a superior shopping experience unlike any other withing our industry. INNOVATIVE, RADIAL ARM, HOLDS 5-17 POUND MONITORS/KDS Barcoding Store, powered by Strategic Mobiltiy Group, LLC (SMG3) offers globally recognized products and industry-leading solutions to enhance your organnization's productivity. Combining optimal search functionality and industry-leading products from Zebra, Honeywell, AML, etc., Barcoding Store creates a superior shopping experience unlike any other withing our industry. NCR, 4GB BASE MEMORY, DDR3, 1600MHZ (1X4) Barcoding Store, powered by Strategic Mobiltiy Group, LLC (SMG3) offers globally recognized products and industry-leading solutions to enhance your organnization's productivity. Combining optimal search functionality and industry-leading products from Zebra, Honeywell, AML, etc., Barcoding Store creates a superior shopping experience unlike any other withing our industry. Material Description: Premium silver gloss thermal transfer polyester label with a high-performance permanent acrylic adhesive. Ideal for applications requiring up to 3 years outdoors, resistance to moderate chemicals and temperature exposure up to 300?F. Additional Information: UL/cUL indoor/outdoor and CSA indoor/outdoor recognition when paired with Zebra's 6200, 5095 and 5100 resin ribbon. Additional Information: 2 labels across. UL/cUL indoor/outdoor and CSA indoor/outdoor recognition when paired with Zebra's 5095 and 5100 resin ribbon. Estimated Case Weight: 4 lbs. EXTREME NETWORKS, ONE-YEAR SERVICE, EXTREMEWORKS, CLOUD 4 HOUR ONSITE FOR 16561, NON-CANCELLABLE, NON-RETURNABLE Barcoding Store, powered by Strategic Mobiltiy Group, LLC (SMG3) offers globally recognized products and industry-leading solutions to enhance your organnization's productivity. Combining optimal search functionality and industry-leading products from Zebra, Honeywell, AML, etc., Barcoding Store creates a superior shopping experience unlike any other withing our industry. LG, WARRANTY, 5 YR TTL TERM COVERAGE (65'' TV SIGNAGE) Barcoding Store, powered by Strategic Mobiltiy Group, LLC (SMG3) offers globally recognized products and industry-leading solutions to enhance your organnization's productivity. Combining optimal search functionality and industry-leading products from Zebra, Honeywell, AML, etc., Barcoding Store creates a superior shopping experience unlike any other withing our industry. Additional Information: 2 labels across. UL/cUL indoor/outdoor and CSA indoor/outdoor recognition when paired with Zebra's 6200, 5095 and 5100 resin ribbon. Additional Information: 3 labels across. UL/cUL indoor/outdoor recognition and CSA indoor/outdoor recognition when paired with the following Zebra ribbon series: 3200, 6100, 5586, 5095, and 6200. Additional Information: 3 labels across. UL/cUL indoor/outdoor and CSA indoor/outdoor recognition when paired with Zebra's 6200, 5095 and 5100 resin ribbon. Additional Information: 2 labels across. UL/cUL indoor/outdoor recognition and CSA indoor/outdoor recognition when paired with the following Zebra ribbon series: 3200, 6100, 5586, 5095, and 6200. Additional Information: 2 labels across. UL/cUL indoor/outdoor certification when paired with Zebra's 5586 ribbon. Estimated Case Weight: 6 lbs. Additional Information: 3 labels across. UL/cUL indoor/outdoor certification when paired with Zebra's 5586 ribbon. ZEBRACARD, QUICKCARD PROFESSIONAL PHOTO ID KIT INCLUDING SUPPLIES STARTER KIT WITH 500 COMPOSITE CARDS, CARDSTUDIO PRO SOFTWARE, USB HIGH RES CAMERA AND PORTABLE BACKDROP STAND Barcoding Store, powered by Strategic Mobiltiy Group, LLC (SMG3) offers globally recognized products and industry-leading solutions to enhance your organnization's productivity. Combining optimal search functionality and industry-leading products from Zebra, Honeywell, AML, etc., Barcoding Store creates a superior shopping experience unlike any other withing our industry. NCR, COUNTERPOINT, XR7 15" RES; INTEL I3; 120GB SSD; 8GB; P2P MSR; WIN10-64; 6 PORT; 2X20 Barcoding Store, powered by Strategic Mobiltiy Group, LLC (SMG3) offers globally recognized products and industry-leading solutions to enhance your organnization's productivity. Combining optimal search functionality and industry-leading products from Zebra, Honeywell, AML, etc., Barcoding Store creates a superior shopping experience unlike any other withing our industry.